Pregnancy with complete mole and coexisting live fetus is rare with an incidence of 1 in 22,000–100,000 pregnancies. Such pregnancy is also known as “sad fetus syndrome.” We report a case of a 27-year-old Nigerian female (Hausa) G5P 4 + 0A2,who presented to our labor ward on the March 19, 2016, at 34-week gestational age with complaints of bleeding per vaginum and associated labor pains. Transabdominal two-dimensional ultrasound on admission revealed a live fetus in breech presentation, with anteriorly located placenta and a huge mass of mixed echogenicity with “snow-storm” pattern within the uterine cavity posteriorly located and not occluding internal os. She had assisted breech delivery of a live male infant with Apgar scores of 6 and 9 in the first and 15th min, respectively, and weight of 2.5 kg. The placenta was delivered by controlled cord traction, and she expelled “grape-like” tissues as well. In Kano, patients do attend different hospitals and present to the tertiary center when complications arise. We believe that this case will increase vigilance of medical personnel, who evaluate patients during first presentation to the hospital. Gestational trophoblastic disease refers to a spectrum of interrelated but histologically distinct tumors originating from the placenta. The most common presentation in the spectrum of gestational trophoblastic disease is hydatidiform mole, categorized as either complete or partial. Complete moles have diploid karyotype and all 46 chromosomes. They are of paternal origin as a result of fertilization of an ovum lacking maternal genes by haploid sperm that duplicates its chromosomes or by dispermic fertilization. It is characterized by varying degrees of trophoblastic proliferation and edema of the chorionic villi with no evidence of fetal tissue development. Partial mole has triploid karyotype, 69 chromosomes composed of two haploid sets of paternal and one set of maternal origin resulting from dispermic fertilization of a normal ovum. The fetus coexisting with partial mole is triploid with abnormal growth and multiple malformations. The incidence of gestational trophoblastic disease varies in different regions of the world. In North America, Australia, New Zealand, and Europe, the incidence of hydatidiform mole ranges from 0.57 to 1.1/1000 pregnancies, whereas studies from Southeast Asia and Japan have shown an incidence of 2.0/1000 pregnancies. In Ile-Ife, Southwestern part of Nigeria, the incidence was reported to be 2.4/1000 pregnancies, whereas in Kano, a North-Western state, it was 4.5/1000 deliveries., Pregnancy with complete mole and coexisting live fetus is rare with an incidence of 1 in 22,000–100,000 pregnancies. Presentation can be as a singleton pregnancy with triploid partial mole (69 chromosomes: 23 maternal and 46 paternal) or a complete mole (diploid paternal) coexisting with a normal fetus (46 chromosomes: 23 maternal and 23 paternal) in a dichorionic twin pregnancy., Pregnancies with healthy fetus and coexisting complete mole have higher risks of complications such as spontaneous abortions, hyperemesis gravidarum, ovarian cyst rupture or torsion, preeclampsia, thromboembolic disease, vaginal bleeding, intrauterine fetal demise, preterm delivery, invasive mole, and choriocarcinoma., Such pregnancy is also known as “sad fetus syndrome,” when pregnancy with chromosomally normal and viable fetus is terminated due to fatal complications associated with complete mole. It is important to differentiate a complete mole from partial mole as complete mole has a higher malignant potential. Diagnosis of hydatidiform mole is based on the following morphologic criteria: hydropic enlargement and scalloping of the villi, cistern formation, disappearance or collapse of the stromal vasculature, trophoblastic inclusion, and hyperplasia. The specificity of histologic criteria for the diagnosis of complete hydatidiform mole is reported to be 66.7%. In a multiple pregnancy, however, morphological distinction between a complete and partial mole is not applicable because a living fetus can be found in both. Cytogenetic evaluation is the gold standard in the identification of the type of mole and the genetic composition of the conceptus, especially in a multiple pregnancy., Variety of techniques are used to differentiate between complete and partial moles such as karyotyping, flow cytometry to determine ploidy, fluorescent hybridization, polymerase chain reactions (PCR) amplification of short tandem repeat (STR) loci, and immunochemistry for the paternally imprinted gene p57. However, only STR genotyping can discern androgenic diploidy, diandrogenic triploidy, and biparental diploidy. We report a case of a complete hydatidiform mole and live fetus that is phenotypically and karyotypically normal male in a dichorionic twin pregnancy. The consent of the mother was obtained for the use of information and photographs. This case report aimed to increase vigilance of medical personnel who evaluate patients at first presentation to the hospital, as early referral to the tertiary center for complete evaluation, and close monitoring is very vital for the prevention of possible fatal maternal complications. A 27-year-old Nigerian female G5P4 + 0, A2 who booked elsewhere for antenatal care, presented to our labor ward on March 19, 2016, at 34 weeks of gestational age with complaints of bleeding per vaginum and associated labor pains of 5 h duration. The bleeding was light at the onset but increased over time and was associated with the passage of clots and some grape-like vesicles. Total blood loss of 200 ml approximately was estimated. About the same time, she started having labor pain, which was increasing in frequency, intensity, and duration, but there was no drainage of liquor. She had a transabdominal two-dimensional ultrasound on admission which revealed a live fetus in breech presentation with anteriorly located placenta and adequate liquor volume. The fetal heart rate was 146 beats/min. The femoral length measured 65 mm, while the biparietal diameter was 86 mm. The estimated gestational age was 32 weeks, while the estimated fetal weight was 2100 g. No gross structural abnormality was detected. There was a huge mass of mixed echogenicity with “snow-storm” pattern within the uterine cavity, posteriorly located and not occluding the internal os [Figure 1]. The patient was admitted at gestational age of 12 weeks on account of hyperemesis gravidarum in a peripheral hospital. She also had an episode of bleeding per vaginum at gestational age of 24 weeks, which subsided spontaneously after conservative management. No sonological evaluation then was done. Her second infant was clinically diagnosed with meningomyelocele and died a day after spontaneous vaginal delivery at home in 2012; the third infant was a fresh “stillborn” at term delivered at home in 2013. She was not a known hypertensive or diabetic but had an elevated blood pressure on admission without proteinuria. She had a family history of twins by her elder sister. Clinical examination revealed a young woman, who was not pale and had no peripheral lymphadenopathy or pedal edema. She had no thyroid gland enlargement. Her pulse rate was 84 beats/min, and blood pressure was 140/90 mmHg. She had no proteinuria. On abdominal examination, the symphysis-fundal height was 38 cm, which was larger than her gestational age of 34 weeks. It was a singleton fetus lying longitudinally and presenting breech, with two-fifth palpable per abdomen. There were four strong contractions in 10 min, lasting 56 seconds. The liver, spleen, and kidneys were not enlarged. Pelvic examination revealed fully dilated cervix and intact membranes. Artificial rupture of the membrane was done and she had an assisted breech delivery of a live male infant with Apgar scores of 6 and 9 on 1st and 15th min, respectively, weighing 2.5 kg [Figure 2]. Infant was taken to the Special Care Baby Unit for further care. The placenta was delivered by controlled cord traction, and she expelled “grape-like” tissues as well [Figure 3]. The placenta was separated from the molar tissue and appeared normal on examination. She had manual vacuum aspiration after delivery, and the total blood loss was estimated at 400 ml. The total duration of labor was 5 h and 40 min. The placenta and vesicles were taken for histopathological evaluation. She had a packed cell volume of 39%, blood group B Rhesus “D”-positive, hemoglobin genotype AA, and the serum level of beta-human chorionic gonadotropin (β-hCG) on admission was 9976 mIU/ml. 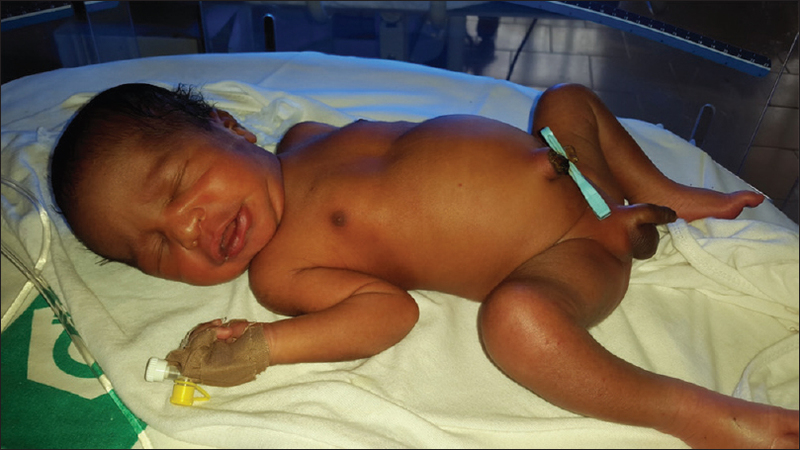 Neonatal evaluation at birth revealed a plethoric infant with peripheral cyanosis but no fever or dehydration. There were no dysmorphic features. The infant had an occipitofrontal diameter of 33 mm, length of 49 mm, and weight of 2.5 kg. The Ponderal index was 2.1, while the Apgar scores were 6 and 9 at 1st and 15th min, respectively. There was incomplete Moro reflex and poor suckling reflex but good grasp. Muscle bulk was normal. The heart rate was 140 beats/min and both first and second heart sounds were present. The respiratory rate was 72 cycles/min with bronchial breath sound. No abnormalities were found on examination of the abdomen, the genitalia, and musculoskeletal system. An assessment of a late preterm 1st twin was made and patient was discharged 7 days after delivery. 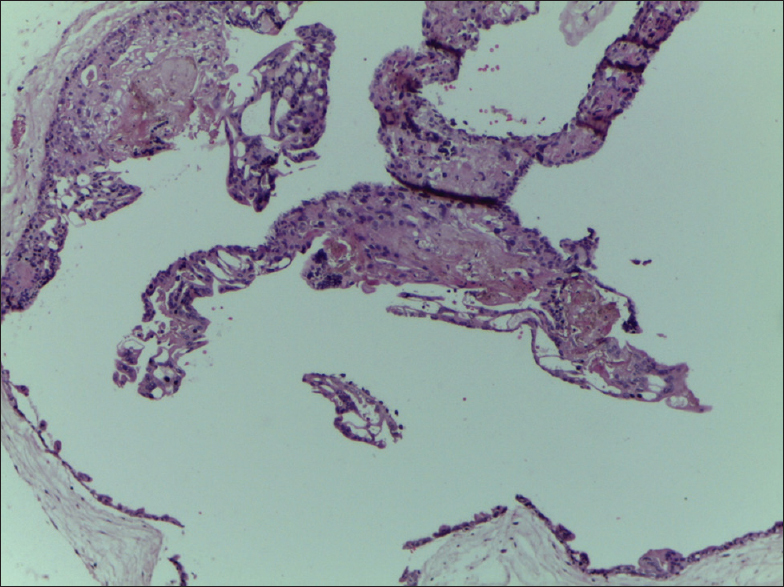 Gross histopathological evaluation revealed a well-developed placenta with a diameter of 17 cm and weighing 550 g. The maternal surface was smooth with prominent vascularity, while the fetal surface showed a cord 30 cm in length. 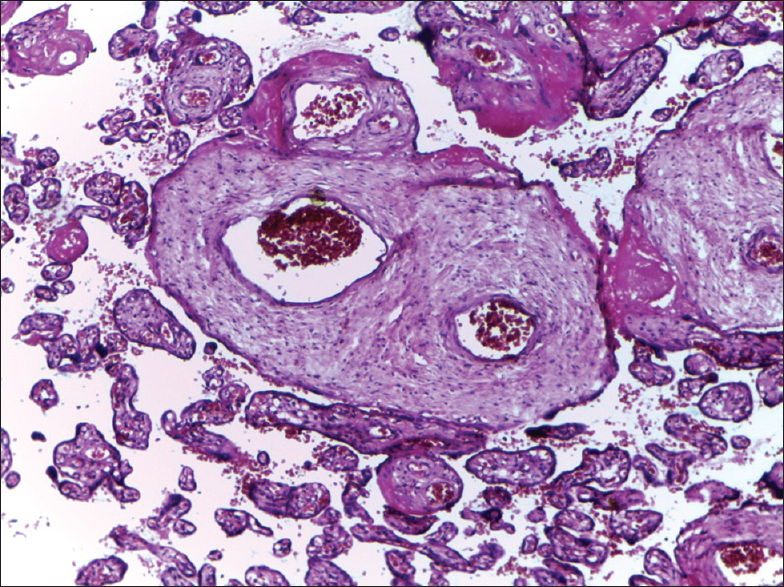 This was accompanied by mass of grape-like vesicles aggregating 14 cm across and weighing 450 g. Histological section of the placental tissue from the fetal surface showed mature, well-vascularized chorionic villi, and congested vessels [Figure 4], while sections from the mass of grape-like vesicles showed enlarged, edematous avascular chorionic villi lined by trophoblastic cells exhibiting florid hyperplasia. 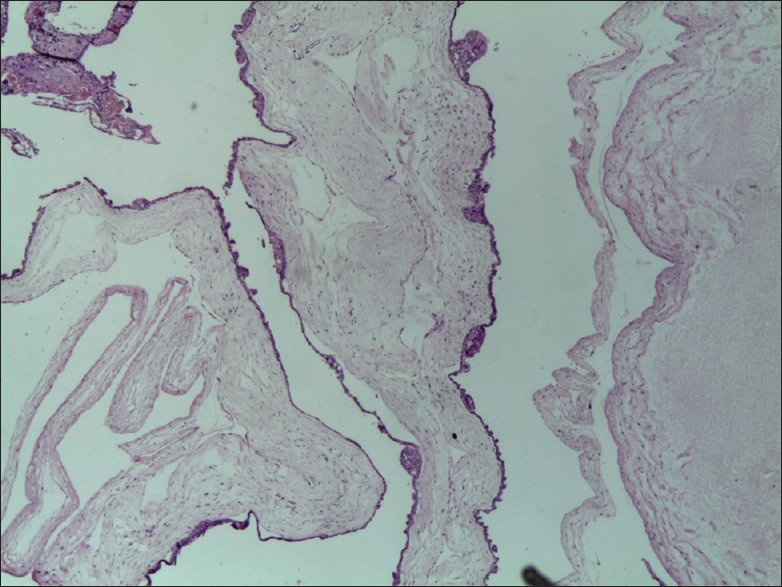 An assessment of hydatidiform mole coexisting with normal placenta was made [Figure 5] and [Figure 6]. A molecular study using PCR on the molar tissue revealed a diploid 46XY karyotype. No aneuploidy was detected. Patient was followed-up at 2 weekly intervals by monitoring serum β-hCG to avoid the risk of false-negative urine pregnancy test's results known as “Hook effect.” Two weeks after delivery, the serum level of β-hCG was 1596.16 mIU/ml, and 6 weeks after delivery, the patient's serum β-hCG concentration had returned to normal level (5 mIU/ml) and remained normal for 6 months after delivery. During the follow-up period, patient was counseled to use a barrier method of contraception to have accurate β-hCG surveillance. There was no evidence of any persistent trophoblastic disease 1 year later (the serum level of β-hCG remained normal). Hydatidiform mole is a benign tumor of the trophoblast. Risk factors for molar gestation include extreme of ages <20 years and >40 years, low socioeconomic status, women with low protein and fat intake, with a history of spontaneous abortion or previous molar gestation, and women with blood A impregnated by man with blood group O. It may also have a genetic basis. Various genes have been studied to determine their involvement in the development of molar pregnancy, some of these include p53 (tumor suppressor gene) that maintains genomic stability either by inducing cell-cycle arrest or apoptosis, BCL-2 (a pro-survival molecule) that enhances growth and survival of cells, and epidermal growth factor receptor (EGF-R) that can stimulate cell division and differentiation. A prominent expression of both EGF-R and BCL-2 (indicators of cell proliferation/survival) and the lack of p53 protein expression are found in the complete mole and support their involvement in the development of these tumors. Familial recurrent hydatidiform mole has been described, suggesting the role of genetic abnormality in the development of the condition. Genetic mapping has shown that, in most families, the gene responsible is located at 1.1 Mb region on chromosome 19q13.4. Mutations in this gene result in dysregulation of imprinting in the female germ line with the abnormal development of both embryonic and extraembryonic tissue. The patient presented here had a history of clinically diagnosed meningomyelocele in her second pregnancy and a fresh “stillborn” at term in her third pregnancy, suggesting that she may have had an underlying genetic abnormality that predisposed her to develop the condition. In majority of cases, pregnancy termination was reported, due to maternal complications, such as spontaneous abortions, hyperemesis gravidarum, ovarian cyst rupture or torsion, preeclampsia, thromboembolic disease, vaginal bleeding, intrauterine fetal demise, preterm delivery, invasive mole, and choriocarcinoma. Fishman et al. reported the incidence of pregnancy termination to be as high as 71%. About 40% result in live birth without fetal anomalies though increasing the risk of persisted gestational trophoblastic disease as reported by Sebire et al. Clinical guidelines in the management of gestational trophoblastic disease have been developed, but the optimal management protocol of pregnancies with complete mole and coexisting live fetus is uncertain. Continuation of pregnancy is possible with careful monitoring. 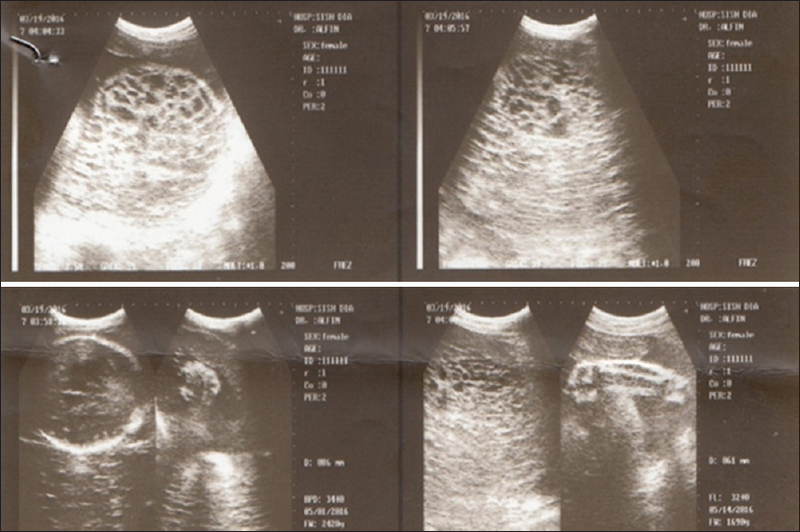 First-trimester ultrasonography evaluation is paramount to diagnose such condition. Prenatal fetal karyotype will help in the decision of termination or continuation of the pregnancy: with triploid fetal karyotype, discussion with couple on termination of pregnancy is recommended, while with diploid karyotype, continuation of pregnancy is possible. Detailed information should be given to couples regarding maternal complications, such as severe preeclampsia, hemorrhage, thyrotoxicosis, or trophoblastic embolization, when termination of pregnancy will be lifesaving. The incidence of gestational trophoblastic disease following such pregnancies is 50%–60% and there is also increased risk of persistent trophoblastic disease., The persistent trophoblastic disease develops irrespective of the time pregnancy is interrupted, and even when intervention occurs early in pregnancy. Fundal height, lower level of platelets count, and higher levels of β-hCG are found to be promising predictors that can be used to detect patients at risk of gestational trophoblastic tumors. These predictors can help in early treatment and can lead to a higher response to cure. Our patient presented with a complete hydatidiform mole coexisting with a live fetus. Infant and molar tissues probably have developed from the same conceptus. However, this condition was suspected late, while in labor, by demonstration of the normal placenta and molar tissue using bedside ultrasound. The diagnosis was confirmed after delivery by gross and microscopic evaluation of the tissues. The patient had uncomplicated postpartum period with no evidence of persistence of trophoblastic disease after 6 months of follow-up evidenced by normal sonological studies and normal levels of serum β-hCG. From our experience, patients attend different health facilities and only present to the tertiary centre when complications arise. We believe that, this case report will increase vigilance of medical personnel who evaluate patients at first presentations to the hospital taking into consideration the higher incidence of gestational trophoblastic disease in west Africa compared to European Countries and America.,, Early referral to tertiary centre for complete evaluation and close monitoring during pregnancy and postpartum period are very vital, thus improving the opportunities for prospective observational studies and even perhaps interventional research in Nigeria and West Africa. Schorge JO, Schaffer JI, Halvorson LM, Hoffman BL, Bradshaw KD, Cunningham FG. Gestational trophoblastic disease. In: Williams Gynecology. Dallas, Texas (US): McGraw-Hill Companies, Inc.; 2008. p. 755-70. Lurain JR. Gestational trophoblastic disease I: Epidemiology, pathology, clinical presentation and diagnosis of gestational trophoblastic disease, and management of hydatidiform mole. Am J Obstet Gynecol 2010;203:531-9. Eniola OA, Mabayoje P, Ogunniyi SO. Hydatidiform mole in Ile-Ife, Nigeria: A 10-year review. J Obstet Gynaecol 2001;21:405-7. Ibrahim Y, Idris A, Yunus E. Gestational trophoblastic disease in a teaching hospital in Northern Nigeria. Am J Bio Sci 2015;1:7-10. Vimercati A, de Gennaro AC, Cobuzzi I, Grasso S, Abruzzese M, Fascilla FD, et al. Two cases of complete hydatidiform mole and coexistent live fetus. J Prenat Med 2013;7:1-4. Moini A, Ahmadi F, Eslami B, Zafarani F. Dizygotic twin pregnancy with a complete hydatidiform mole and a coexisting viable fetus. Iran J Radiol 2011;8:249-52. 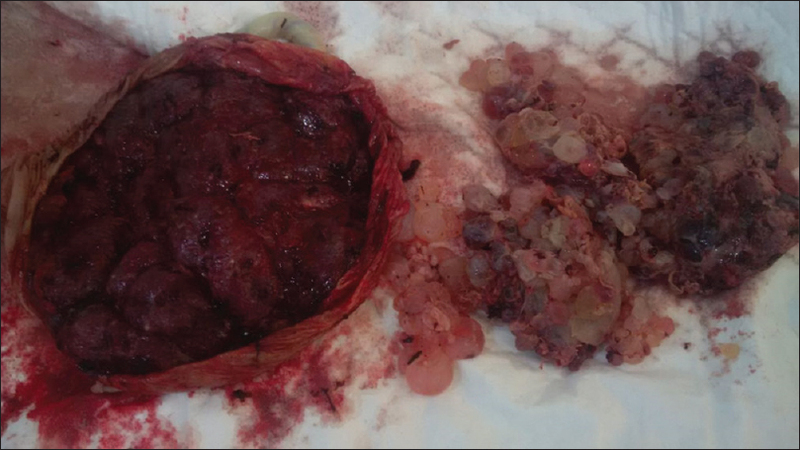 Bans B, Hassan OT, Ece B, Elmin E, Mert K. Complete hydatidiform mole presenting as placenta previa in a twin pregnancy with coexisting normal fetus: Case report. J Turk Ger Gynecol Assoc 2014;15:256-8. Sheik S, Al-Riyami N, Mathew NR, Al-Sukaiti R, Qureshi A, Mathew M, et al. Twin pregnancy with a complete hydatidiform mole and a coexisting live fetus: Rare entity. Sultan Qaboos Univ Med J 2015;15:e550-3. Shozu M, Akimoto K, Kasai T, Inoue M, Michikura Y. Hydatidiform moles associated with multiple gestations after assisted reproduction: Diagnosis by analysis of DNA fingerprint. Mol Hum Reprod 1998;4:877-80. Ishikawa N, Harada Y, Tokuyasu Y, Nagasaki M, Maruyama R. Re-evaluation of the histological criteria for complete hydatidiform mole: Comparison with the immunohistochemical diagnosis using p57KIP2 and CD34. Biomed Res 2009;30:141-7. Harada I, Tsutsumi O, Takai Y, Iida T, Sakai M, Yoshikawa H, et al. DNA polymorphism analysis of a case of complete hydatidiform mole coexisting with a fetus. Hum Reprod 1997;12:2563-6. Murphy KM, McConnell TG, Hafez MJ, Vang R, Ronnett BM. Molecular genotyping of hydatidiform moles: Analytic validation of a multiplex short tandem repeat assay. J Mol Diagn 2009;11:598-605. Cormano J, Mackay G, Holschneider C. Gestational trophoblastic disease diagnosis delayed by the hook effect. Obstet Gynecol 2015;126:811-4. Hussein MR. Analysis of p53, BCL-2 and epidermal growth factor receptor protein expression in the partial and complete hydatidiform moles. Exp Mol Pathol 2009;87:63-9. Fisher RA, Hodges MD, Newlands ES. Familial recurrent hydatidiform mole: A review. J Reprod Med 2004;49:595-601. Fishman DA, Padilla LA, Keh P, Cohen L, Frederiksen M, Lurain JR, et al. Management of twin pregnancies consisting of a complete hydatidiform mole and normal fetus. Obstet Gynecol 1998;91:546-50. Sebire NJ, Foskett M, Paradinas FJ, Fisher RA, Francis RJ, Short D, et al. Outcome of twin pregnancies with complete hydatidiform mole and healthy co-twin. Lancet 2002;359:2165-6. Santaballa A, García Y, Herrero A, Laínez N, Fuentes J, De Juan A, et al. SEOM clinical guidelines in gestational trophoblastic disease (2017). Clin Transl Oncol 2018;20:38-46. Lee SW, Kim MY, Chung JH, Yang JH, Lee YH, Chun YK, et al. Clinical findings of multiple pregnancy with a complete hydatidiform mole and coexisting fetus. J Ultrasound Med 2010;29:271-80. Nassiri S, Akhavan S, Nahavandian N. Are there any predictive factors in molar pregnancy for persistent gestational trophoblastic diseases.? Int J Curr Res 2017;9:61391-3. Available from: http://www.journalcra.com. [Last accessed on 2017 Aug 15].